In a stunning upset, Scott Schmerelson handily defeated two-term incumbent Tamar Galatzan in the race for LA Unified’s District 3 seat. Schmerelson beat Galatzan with more than 3,000 votes, 55 percent to 45 percent. “I am very happy, very excited, and I’m ready for my five-year term,” he told LA School Report late last night, referring to the extended term school board members will be serving following a voter approved measure aligning local elections with state and federal races. While many observers predicted the outcome of the election in District 5 — between Bennett Kayser and Ref Rodriguez — would determine the future ideological balance of the seven member board, it is Schmerelson’s victory that ensures the so-called “reformers” will remain in the minority despite Kayser’s loss. “I intend to be perfectly fair,” Schmerelson said, unwilling to describe himself as either pro-charter, pro-union, or pro-anything specific. 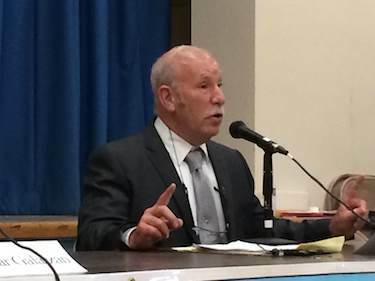 The teachers union threw its support behind the veteran educator after the primary race in an effort to elect “anyone but Galatzan” according to UTLA PAC official, Marco Flores. An hour before the final results had been tabulated Schmerelson fielded congratulatory hugs and handshakes from party-goers, putting down his cell phone to say “thanks” every two minutes. But even through the self-described elation, the jabs he endured from Galatzan’s campaign and the California Charter Schools Association PAC, still stung. “I feel bad about a couple of the things that were said about me,” he said. Several attack ads depicted Schmerelson as a “Sacramento lobbyist” intent on taking money from children to give to administrators. Other flyers, sent to registered Republican voters, called him a Liberal. “I know because I got one because I’m a Republican,” he said laughing. “I’m not a politician and I’m not used to this telling of untruths,” he said. Galatzan’s campaign had yet to issue a formal concession by late last night, but campaign consultant Jose Cornejo blamed voter apathy for her defeat.